Rehearsal Spaces: Jets is open to young people and community groups to conduct rehearsals. All rooms are equipped with loud PAs, microphones and other musical equipment on request. There is also space to meet and hold meetings. Recording Studio: As well as providing space, equipment and state-of-the-art recording facilities for bands and performers, Jets also has experienced studio engineers available to assist with recording, mixing, pre and post-production. Visual: Jets is equipped with a dedicated Green Screen filming studio and a Multimedia Hub, complete with all the equipment and editing software required to capture a moment or edit a short film. Events: Jets has a portable PA system that is available for events. It is suitable for most indoor spaces and small to medium outdoor venues. 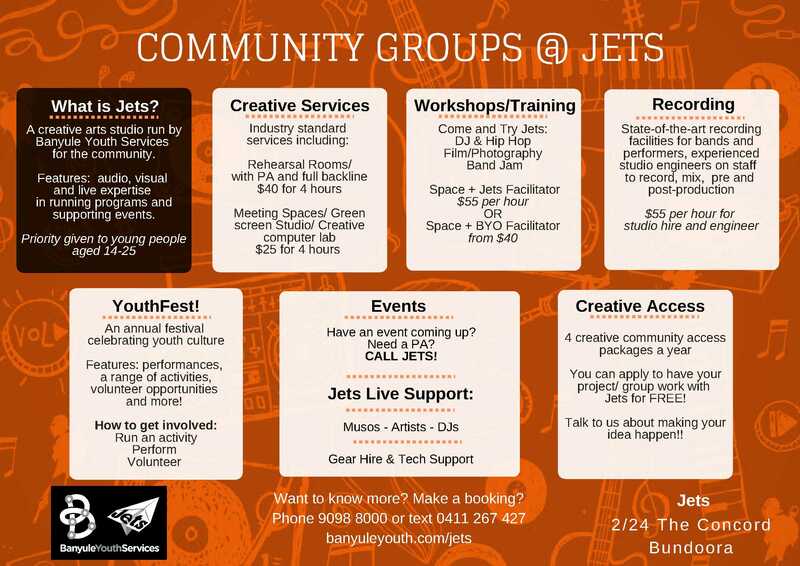 Creative Community Services: Jets utilises our audio, visual and live expertise in running programs for the community. Jets operates in a cost recovery model; we aim to provide high quality equipment, resources and staff skills to the community at affordable prices either at Jets or out in the community.